My home “community”, where I spent so much of my toddler years, summers and teen years is somewhere outside city life and yet not the country. I’m not even a horse owner. I wish I was, though. as if I’m missing out on something special. My fingers itch to reach out and touch the rough yet smooth and hard shoulder of a horse. I want to look into her deep dark eyes and rub the space between. It’s as though horses can see into your own soul sometimes. It’s like having a friend you can talk to without saying a word. I love the way he smells like dirt, sweat, grass and, well, horse. I love how strong she is and yet how gentle she can be. When he plays, it’s amusing. When he is fearful it’s intimidating and yet awesome. When she is brave, I feel a little more brave. When he is tired I just want to take a brush and give a good rubdown….but, I don’t have a horse. I only get to look at other people’s horses and dream. I am a horse dreamer. Of all the animals I find interesting and exciting, horses are my favorite. 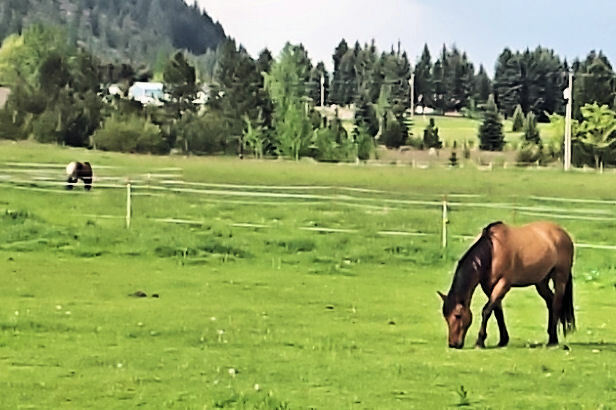 They are beasts that my mind is enamored with and my body longs to connect with as only a rider and horse can do… It’s funny how the strength of a horse leads me to feel safe as opposed to afraid. Are you a horse lover or afraid of them? If you have a horse, what kind of relationship do you have with him/her? Kitty cats are my favorite. Oh, and I guess I should say polar bears, too. 🙂 I love it! Those are almost opposites on an animal spectrum! What makes them special to you?